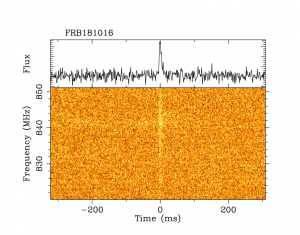 At UTC 2018-10-16-04:16:56.3, we found a bright fast radio burst (FRB181016) as part of the ongoing search program (UTMOST), at the Molonglo telescope. A second, unrelated FRB (FRB181017) was found the following day at UTC 2018-10-17-10:24:37.4 (2018-10-17.4337662). Molonglo is a 1.6 km long East-West array (Bailes et al 2017) and was operating in drift-scan mode with pointing centred on the meridian at the time of detection. Source localisation is excellent in Right Ascension (5 arcsec at 1-sigma) but poor in Declination (~1.2 deg at 1-sigma) (see Caleb et al 2017). FRB181016 and FRB181017 were found during a blind FRB search programme in real-time using an automated GPU-accelerated/machine learning based pipeline and the raw voltages were recorded for offline processing. 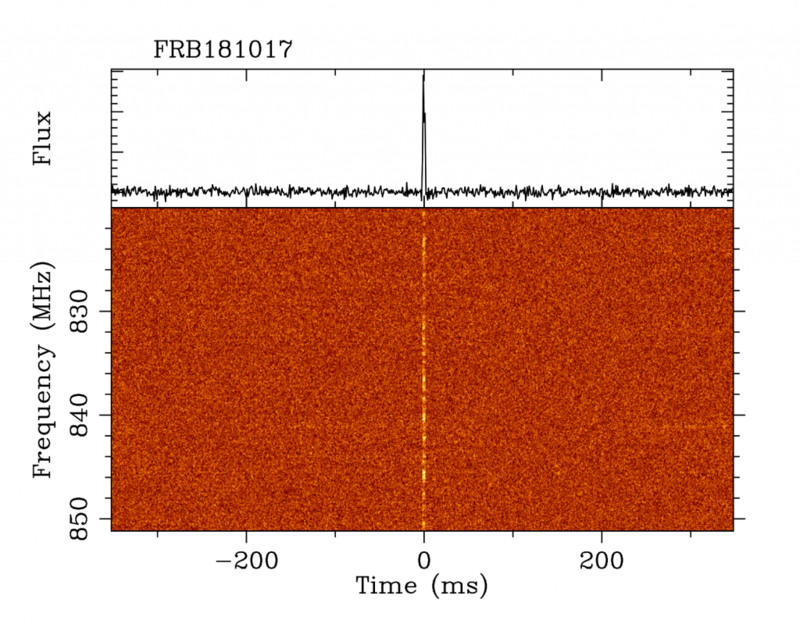 FRB180116 : The dispersion measure (DM) that maximizes the signal-to-noise ratio is: 1984 pc cm^-3. The DM estimate of NE2001 model is ~90 pc cm^-3, and YMW16 model is ~69 pc cm^-3 at the position of the FRB, resulting in an intergalactic excess of ~1900 pc cm^-3. The upper limit on the DM-inferred redshift is thus z ~ 1.8. 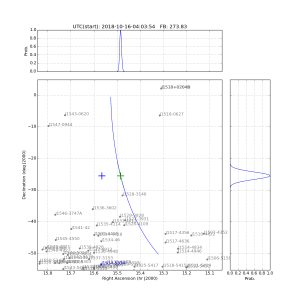 An early estimate (lower limit) of the event’s apparent fluence is ~ 70 Jy ms (corrected for attenuation of the primary beam in the RA direction, but not in the Dec direction), width ~ 6.88 ms, with a detected signal-to-noise ratio = 20. 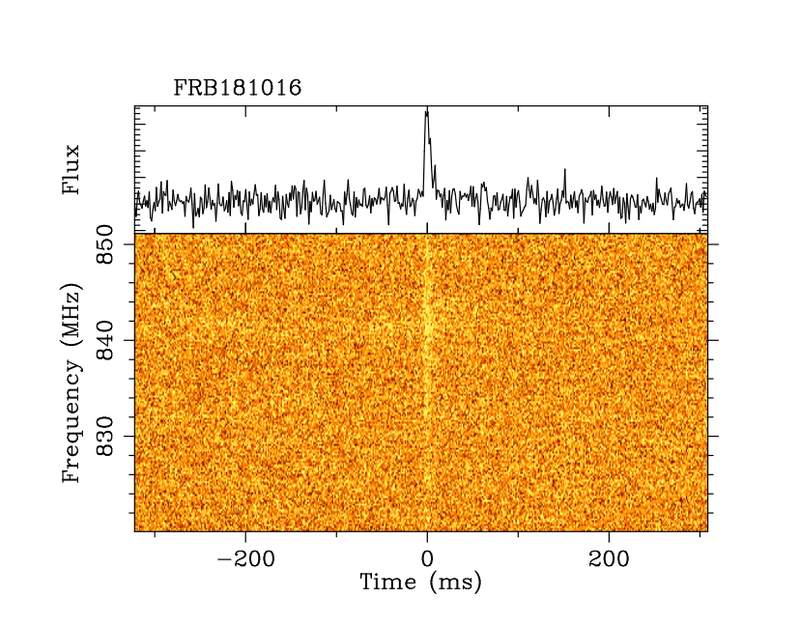 Dedispersed dynamic spectrum of FRB181016. A small amount of residual RFI is seen in the left half of the plot at a frequency of ~840-842 MHz, and is not part of the FRB. 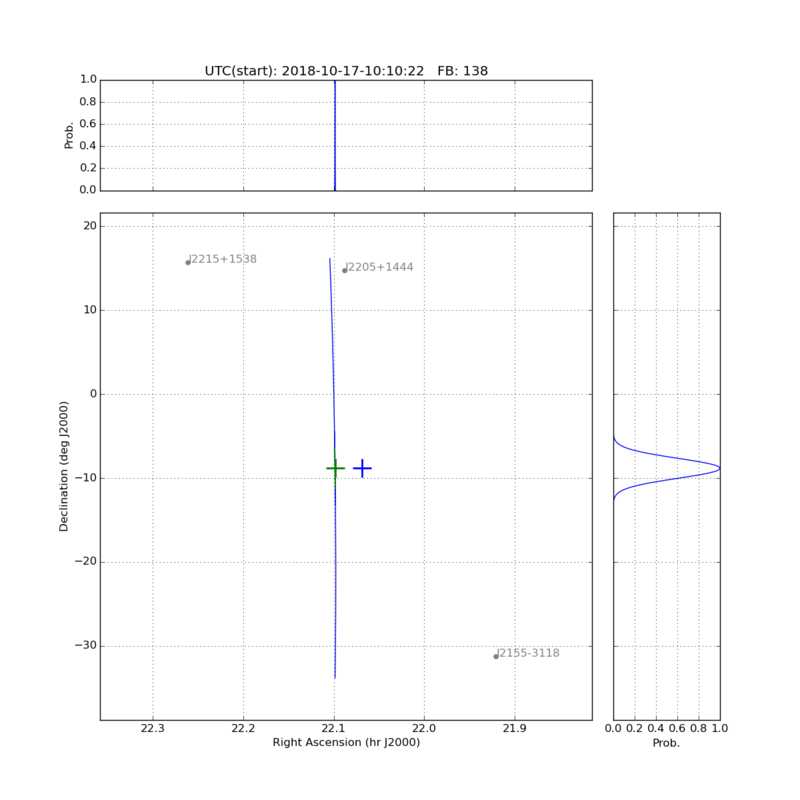 Localisation plot for FRB181016, with the center of the localisation arc marked by the green cross. The telescope boresight position is marked by the blue cross. FRB180117 : The dispersion measure (DM) that maximizes the signal-to-noise ratio is: 240 pc cm^-3. The DM estimate of NE2001 model is ~38 pc cm^-3, and YMW16 model is ~27 pc cm^-3 at the position of the FRB, resulting in an intergalactic excess of ~205 pc cm^-3. The upper limit on the DM-inferred redshift is thus z ~ 0.2. 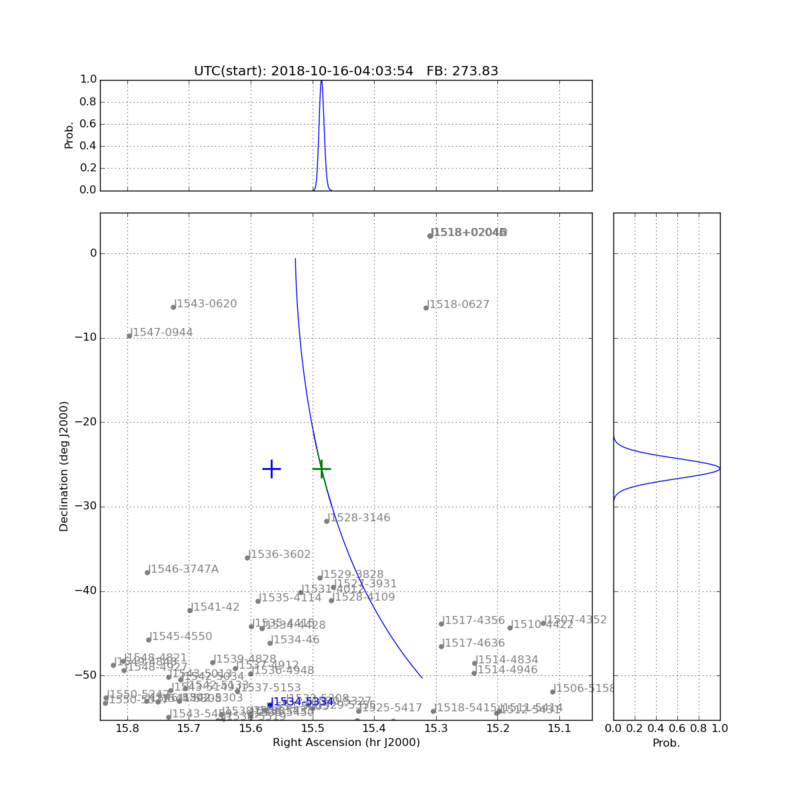 An early estimate (lower limit) of the event’s apparent fluence is ~ 95 Jy ms (corrected for attenuation of the primary beam in the RA direction, but not in the Dec direction), width ~ 2.6 ms, with a signal-to-noise ratio = 66. 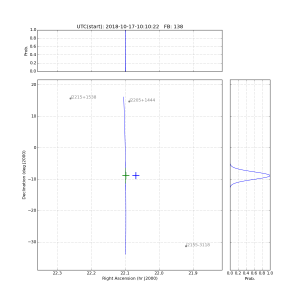 Localisation plot for FRB181017, with the center of the localisation arc marked by the green cross. The telescope boresight position is marked by the blue cross. Follow-up observations of the FRBs are encouraged.